What makes Aro Valley our Eco Valley? Aro Valley is quickly taking the title of Eco Valley, as recently resident Julia Stace, Te Aro School and the Aro Valley Community Center have all had solar panels installed, which will produce their own renewable power. This will add to the valley’s legacy of already being a leader in community action. In this two part series these Aro Valley initiators talk about what they think contributes to Aro Valleys constant action towards positive environmental change. 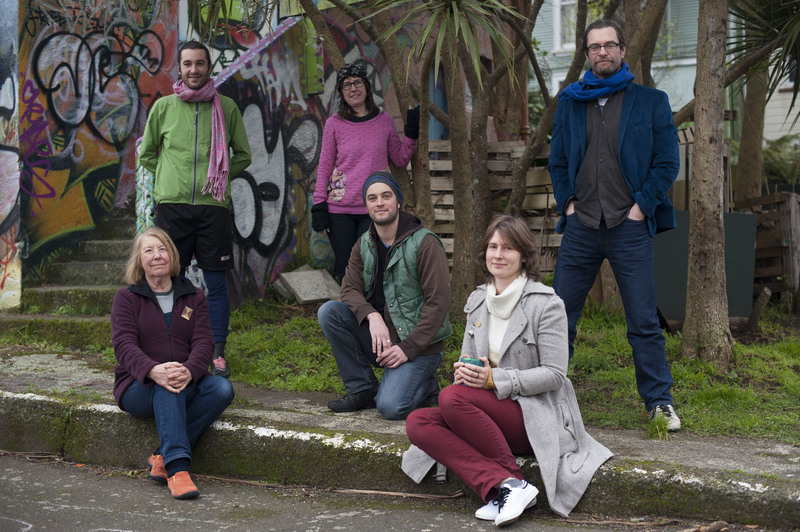 In part 1 resident Julia Stace ( far left) on why she installed photo Voltaic cells on her home and Charles Barrie (centre) from Aro Valley’s community gardens Kai o Te Aro on the surprising benefits of the community gardens and his idea on a vision for Aro Valley. In Part two Louise Sherrell of Aro Solar, (represented by other Aro Solar project team members Miranda Voke 2nd right and Ollie 2nd left), resident Karen MacIntyre ( centre back) on some valley history that changed it forever and community coordinator Kelvin Aris talks about community resilience. A must listen for all communities and neighborhoods trying to kick start change. Thanks to Virginia Woods Jack for the photo. This entry was posted in Social & Civic and tagged Aro Valley, Climate Change, Community Gardens, Conservation, Volunteers by lauriestarfish. Bookmark the permalink.